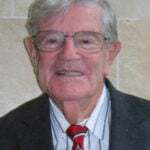 D. Allan Firmage, P.E., Dist.M.ASCE, professor emeritus of civil engineering at Brigham Young University who was active in ASCE across seven decades, died earlier this year. He was 98. Firmage joined ASCE in 1940. The Life Member served on the Board of Direction from 1979 to 1982 as international contact director. As ASCE Utah Section president in 1967-68, he developed the state’s first technical committee on bridges and served as its first chairman. He represented ASCE at two senate committee hearings on bridge rehabilitation and served on other national technical and professional committees. In 1998, Firmage was elevated to Distinguished Member, or Honorary Member as it was then known. During the last years of his career, he had the pleasure of mentoring a granddaughter into civil engineering. Christine Isom, P.E., M.ASCE, followed in his footsteps, teaching a bridge design class at BYU when he retired. Firmage received his bachelor’s degree from the University of Utah in 1940 and master’s from MIT in 1941. During World War II he was employed as a development engineer in the Military Bridges Section of the Research and Development Laboratory, Corps of Engineers, in Fort Belvoir, VA.
After the war he entered academia as a professor of civil engineering at the University of Florida. In 1952 he returned to MIT to pursue research, after which he accepted a position of assistant chief structural engineer for Patchen and Zimmerman Engineers in Augusta, GA. In 1955, Firmage returned to his home state of Utah as a professor of civil engineering at the newly formed College of Engineering at Brigham Young University. During his years at BYU he took a number of leaves for assignments in South Vietnam, India, and Europe. He was invited to lecture on bridge design a number of times in Asia and Europe, including four trips to China beginning in 1979. He authored three engineering textbooks as well as several national magazine articles. Firmage was preceded in death by his wife Margaret in 2000. They spent many enjoyable times together at ASCE conventions and other travels. He is survived by five of his six children, 21 grandchildren, and 29 great-grandchildren.